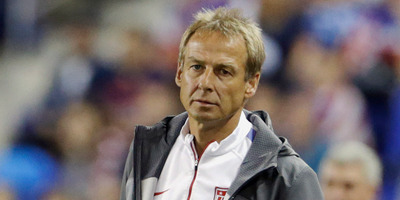 Adam Hunger/GettyFormer U.S. Soccer head coach Jurgen Klinsmann had a terrible effect on the team’s morale and chemistry during his tenure from 2011-2016. A new report from The Ringer details just how extensively former U.S. Soccer head coach Jurgen Klinsmann may have damaged the chemistry of the Men’s National Team. Klinsmann was also accused of being a poor tactician and having an obsessive desire to control all aspects of U.S. Soccer. Klinsmann is said to have had a poor effect on team morale causing the U.S. to lose its fighting mentality which had previously made the team greater than the sum of its parts. Chemistry problems continued even after Klinsmann was let go. A report from Andrew Helms and Matt Pentz in The Ringer goes in-depth into U.S. Soccer’s failure to qualify for the 2018 World Cup and places the bulk of the blame on former U.S. head coach Jurgen Klinsmann for having a corrosive effect on the team’s culture. Klinsmann, as was known publicly, had been pursued by U.S. Soccer for the head coaching job for years before the federation president Sunil Gulati finally got him to sign in 2011. Previous attempts at hiring Klinsmann, Helms, and Pentz wrote, had stalled due to his salary demands and, more importantly, Klinsmann’s desire for greater control of the program. That desire for control would become a recurring issue during his tenure. In Helms’ and Pentz’s telling of events, it was Klinsmann’s handling of how he announced the final 23-man roster for the 2014 World Cup – in which Klinsmann infamously left off U.S. Soccer legend Landon Donovan – that became a major flashpoint in his coaching tenure. A couple of different players found the way they were notified that they would be left off of the World Cup squad to be unnecessarily callous. Veterans like Evans and Goodson were regarded as key locker-room leaders. In their place was a cohort of German Americans including John Brooks, Fabian Johnson, and Green - on paper, talented players, but subject to occasional grumbling about their commitment to the squad. The complaints about German American players could have xenophobic undertones, but over time - rightly or wrongly - Klinsmann’s perceived preferential treatment for this group of players would damage team morale. Cutting Donovan brought into public view the behind-closed-doors battle for control of U.S. Soccer that was waged during the Klinsmann years. Gulati and Flynn had hired Klinsmann to revolutionise American soccer, but the initial stumbling block over control during his hiring process foreshadowed the fault lines of an eventual conflict. Dropping the team’s highest-profile player before the World Cup wasn’t a random act; it was part of Klinsmann’s plan to assert control over the team’s culture. In November 2016, at the end of a practice session ahead of what would be Klinsmann’s final match in charge of the U.S. national team, defender Timmy Chandler gave a younger teammate some telling advice. Forward Bobby Wood was nursing minor knocks suffered from the previous match - a disappointing 2-1 loss to Mexico on home soil - and Chandler told him not to risk aggravating his injuries. Wood was still establishing himself as a regular starter in Germany’s Bundesliga. Why, Chandler posited, risk that by overexerting yourself for your country when your club team was paying most of your bills? Wood would play the next match, but the U.S. would lose, 4-0 to Costa Rica. To Helms and Pentz, this anecdote, and the following match are emblematic of how the U.S. team, as a whole, had lost its gritty, fighting mentality that had allowed it to triumph over more talented national teams, such as at the 2002 World Cup when the U.S. made it to the quarterfinals. For those inside U.S. Soccer and for many of the team’s veteran players, the problem was not that Klinsmann wanted to enact change, but that his plans lacked continuity . . . It was hard for players to tell whether a Klinsmann decision was calculated “creative disruption” or just the whim of a coach who woke up with a new idea. Furthermore, NBC Sports analyst Kyle Martino recounted watching a training session and finding the tactical instruction to be a mess. And when Martino later criticised Klinsmann on air, the coach went so far as to try and rescind Martino’s press access, which Martino sees as another sign of Klinsmann’s obsessive need for success. Unfortunately, even after Klinsmann was fired, chemistry problems remained. Geoff Cameron, who had respected Klinsmann and his desire for U.S. players to push themselves by playing abroad, and who was himself one of the few American players who still played in a top-five European league, apparently became a particular issue. In the middle of the resounding 4-0 victory - which put the U.S. within one point of qualification for Russia - Cameron allegedly grumbled to his benchmates about his lack of playing time even as his teammates dominated on the pitch. Word of his complaints reached Arena’s staff, which sealed Cameron’s fate: He would not play in the final match against Trinidad. In Cameron’s place, Omar Gonzalez started in defence, and Gonzalez scored an own goal during the match against Trinidad, which turned out to be enough to knock the U.S. out of the 2018 World Cup.